Empty the seaweed and soup sachets into a bowl. Pour boiling water and it will be ready in 3-5 minutes. 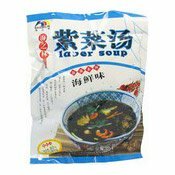 Ingredients: Laver (60%), Dried Vegetables (Carrot, Shallot), Flavour Enhancers (E621, E627, E631), Seafood Flavour Essence (1%). Simply enter your details below and we will send you an e-mail when “Laver Soup (Seafood) (海之林紫菜湯)” is back in stock!